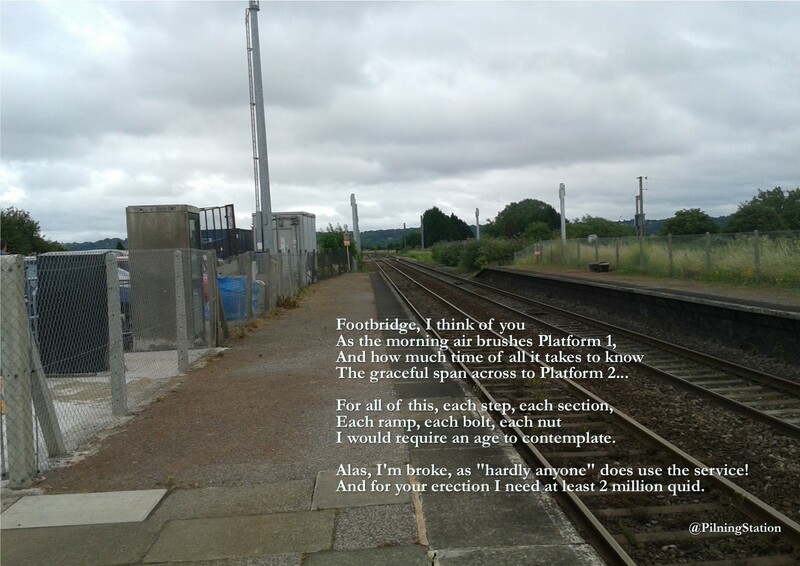 Re: The subject of Pilning Footbridge. Dear friends, at Network Rail, we’re writing again, to you. Pilning has been waiting, a response is overdue. It’s about our footbridge, have you any news? It was twenty-sixteen, when first we heard from you. In a headed letter, sent from your HQ. You said you’d got some work on, ready for the new express. A few tweaks here and there, and Pilning would be next. But we didn’t see this lot coming. Now, we’re just depressed. Wires were going up soon, on our very line. Ready for the new trains: sleek, with quite a shine. But there was a trade-off: our bridge was deemed too low. There was no other option, you told us: it must go. One dark day, in autumn, you whisked our bridge away. Our station’s very different, with this gap across the rails. Nothing calling westbound, a redundant platform two. Eastbound, Saturdays only: A couple of trains won’t do. It's definitely not an upgrade. It seems to us, unreal. It's certain, we're all thinking, we should’ve got a better deal. Cardiff, once was easy. A Bristol return, a breeze. Without our bridge, it's a nightmare, and soon we’ll be on our knees. to ride through the tunnel, to Wales. On the way back from Bristol, it’s twice through the tunnel, we trail. don’t think we can give you, any marks, out of ten. You could easily span this debacle. Just bring our bridge, right back. This so-called, height conundrum, could be fixed, with a trolley jack. Adjustments to its framework, would provide quite ample space. An additional layer of bricks, to revamp the original base. If sadly, ours was recycled. Can you track down, a bridge that’ll fit. We’d love to have it here. We’d look after it. We'd happily help you install it, just give us new hard hats. We look good in hi-vis, with goggles, and all that. With platform two in action, we’d soon be off again. We’d set off for the seaside, with our buckets and spades. Shop all day in Bristol. Nip back and to, to Wales. we’d maybe even show you, some of the things we had. Weekday trains would suit us, you know that this is true. And how about some lighting, and maybe, even a loo? It’d be great for commuters, for families and visitors too. And what about the phone box? Couldn’t it come back? Plenty of folk in Pilning, would really love a chat. We’ll always be sad about our footbridge: it really wasn’t fair. If Paddington had been here, he’d have given you, his hard stare. So, next time you are considering, trying something new. Please, just come and see us: it’s easier, if you do. Don't leave us with one platform, pending a review.